So nice, we bought it twice. Both MKS and MVM own this pleated lace cami dress from Forever 21, and for good reason. It has the perfect ratio of coverage to skin, the small pleats and gathered waist are extra flattering, and the swath of lace at the bottom brings the hemline down to the perfect midi-length. While we love dressing it up, it'd be nice to dress it down too - get to it, HI-STYLERS! Dress, Forever 21. Sweater, New Look. Watch, Asos. Shoes, Nasty Gal. Scarf, American Eagle. Backpack, Everlane. MKS: My favorite part of this dress is how delicate it is - which makes it perfect for pairing with chunky everything. A thick knit sweater and draped scarf will warm up those barely-there straps, and the Jeffrey Campbell booties will bring the dreamy vibe down to earth. To make this less party and more work-y, get practical with a backpack and a watch that doubles as a bracelet - it puts the FUN in FUNctional. MVM: I love this dress because it can be worn so many different ways! I originally wore it to a holiday party with some killer heels, but we all know my one true passion is a good pair of birks. How cute are these Birkenstock inspired Free People sandals? I like the way they dress down the look and add a pop of color to the monochrome of the sweater/dress combo. Throw on a simple necklace and a fun nail polish and you have the perfect Saturday afternoon look. MEM: I don't know about you, but I am pretty much over Winter. Which means I am going to start incorporating some color into my black everything winter wardrobe. 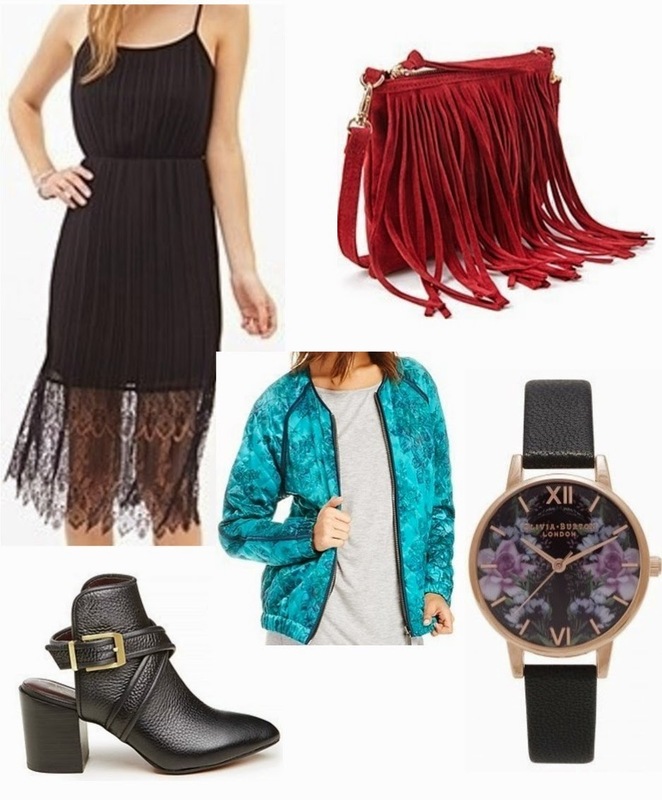 With the addition of this funky floral bomber, red fringe bag, and watch to constantly remind you of what's to come, you will be dancing into Spring in no time at all.